I know a handful of people who have been buying books from Amazon since the late 1990s, and today is their lucky day. Amazon has just announced a new program where past customers who had bought new paper books from Amazon will be able to buy a Kindle edition of the paper books. The program is called Kindle Matchbook, and while it sounds a lot like iTunes Match (and similar services offered by Apple's competitors) it doesn't quite work the same. 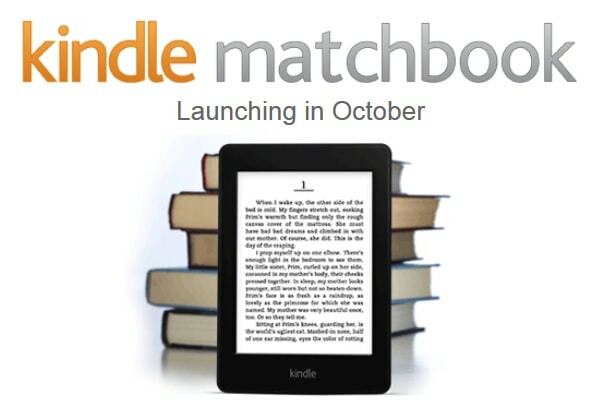 Kindle Matchbook is going to be launching in October, and getting that Kindle ebook could cost you as much as $3. There's also only a limited number of publishers signed up for the program, with around 10,000 titles available when the program goes live. But that is likely to change as more publishers sign up. “If you logged onto your CompuServe account during the Clinton administration and bought a book like Men Are from Mars, Women Are from Venus from Amazon, Kindle MatchBook now makes it possible for that purchase—18 years later—to be added to your Kindle library at a very low cost,” said Russ Grandinetti, VP of Kindle Content. Amazon is promising that you'll be able to look up past purchases in your order history (as far back as 1995) and find out if they are included in the program. After you buy buy the ebook, you'll get access to all the same features as any other Kindle ebook owner including Whispersync, Popular Highlights, and X-Ray. Post sale ebook bundling is a relatively new idea that is growing increasingly popular. For example. Amazon offers a similar program which bundles ebooks and audiobooks. The University of Kentucky Press has launched a similar marketing program, and there is a Canadian startup called Bitlit that is about to launch a platform almost identical to Kindle MatchBook. It will let publishers offer their ebooks to customers either as a free or paid download, just like Amazon's program. Bitlit has a dozen publishers signed up to join the program when it goes live, and I have been told that most will offer their ebooks as free downloads to buyers of paper books. But as great as this sounds, Amazon still hasn't signed up very many publishers. With only 10 thousand titles listed it's pretty clear that most of the titles published by the Big 5 aren't included. That's obviously going to limit the usefulness of the program, but not for long. I would not be surprised to if a lot of legacy publishers signed up for this program. One side effect of this program is that it will support one of the goals of Agency Model. While publishers wanted to restrain Amazon, they also wanted to increase ebook prices so ebooks wouldn't bleed sales away from paper books. The Kindle MatchBook program will increase the value of a paper edition at the expense of the ebook. IMO that serves the purposes of the Big 5. Also, this program can serve as a way for publishers to generate new revenue on previous sales. Readers who had bought a book a decade ago might not be interested in paying retail for the ebook (not when they can get a used copy starting at $4) but they might pay $3 for the Kindle edition. That could be a could be a source of considerable additional windfall revenue for publishers and authors. On the other hand, Kindle MatchBook is owned by Amazon, and in some circles that alone will generate an instant NO. Had this program been announced by any of Amazon's competitors it would probably have received a warmer reception. Honestly, Nate, I’d love to see this program coming to one sector of Amazon: textbook. I guess it will be super instantly popular to students, who are currently buying textbooks from Amazon, and be getting the digital copy (if available, of course), for that low price. Here’s fingers crossed for that. Via KDP, it’s nice from my POV that participation (and pricing) are up to the publisher on a per-title basis. So if traditional outfits don’t go for it, it will become another competitive edge for indies. It’s currently set up so we can choose $0.00, $.99, $1.99, or $2.99.